As one can likely deduce from the title, “Just You and I” is a love song. Or more specifically, it weaves a tale of the types of traits Tom loves in his significant other, the sacrifices he is willing to make in the name of holding her hand and the way he ultimately perceives their relationship. For instance, in terms of the times they share together, you can tell that the highlight of these events in the eyes of Walker is their mutual love of downing alcoholic beverages. In fact the main theme of the first two verses is basically his recollections of fond days consisting of him and his shorty getting boozed together. However, it is not only memories of drunkenness that he brings up. For instance, one of the things he enjoys most about those settings is that during such times, they are able to share their inner feelings with each other. Moreover, he remembers the instances where despite being short on resources, he would still find a way to travel to see her. Near the end of the song, we find that now Tom has successfully ‘saved up’ what would presumably be some cash just so he can be with the woman he loves, even though she is not in close proximity. Now it seems as if he is ready to take the relationship to the next level beyond these occasional meetings. Indeed he is under the belief that he and his darling as a unit have the ability to “take over the world”. As such, he is imploring her to take the gradual steps necessary to make the relationship work as he ultimately perceives her to be just as an important luminary in his life as the sun itself. 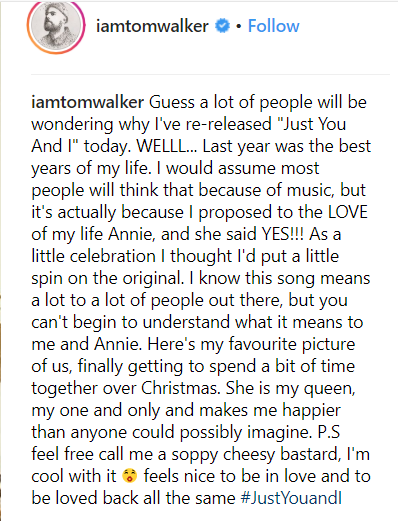 Tom Walker is credited as the sole writer of “Just You and I”. The production of the song, on the other hand, was handled by music producer, Jonathan Quarmby. The song was first released in April 2017. On January 11, 2019, it was re-released. The version that was released in 2017 was an acoustic version. The 2019 version is often regarded as a remix of the 2017 acoustic version. Both the 2017 and 2019 versions were released through Relentless Records. The 2019 version of “Just You and I” was the first content Walker released in 2019. According to Walker, this song was inspired by his significant other named Annie. In an Instagram post, Walker revealed to his fans why he was forced to re-release this song. According to him, he re-released the track due to the happiness he felt after he proposed to his significant other named Annie “and she said YES”. To celebrate her acceptance, he slightly modified the original song and re-released. And why did he do this? Because according to him, this particular song means a lot to not just him but also Annie. On which album does “Just You and I” appear? It appears on the album What a Time to Be Alive. On that same album appears Walker’s breakout hit single “Leave a Light On“.